For a guy who has spent much of his life on one adventure after another, this could be a really long list. To narrow it down, I will post only my favorites…. and tell why they have special appeal to me. Since I am a quiet laid-back guy, most of these are away from the crowds and the noise of the popular parks and resorts. Valley of the Gods, Utah. The desert landscape is remarkable enough; it is an extension of the iconic Monument Valley Tribal Park a few miles away. But when the sun sets you discover you are in Dark Sky country. The Milky Way is dazzling above and hanging over the nearby cliffs. My free campsite was just below a huge butte and there wasn’t a level spot to park, so I drove onto some rocks to level the camper for the night. Complete solitude. And almost unnerving silence. After spending a rainy afternoon at Devil’s Garden, I drove a couple of miles farther down the washboard road and found a flat spot on the open prairie across from Dinosaur Tracks road. This is boon docking – no facilities. No problem, I am self-contained with the truck camper. And all alone for the night. It is hard to find places where one can camp on the beach. Especially on the west coast. This park is two miles long and about 20 feet wide. Everybody gets a 40-foot-long space to park for the night and our rig fit exactly from bumper to bumper. You can walk the beach for miles. No hookups. Again, no problem. I think this was one of the most remote campsites we ever stayed at on our epic trek along the Alaska Highway. At Milepost 533, Coal River is one of the original Roadhouses built to accommodate the construction of the Alaska Highway in 1942-1943 and is beyond the reach of the electric grid. They were generating their own power while we were there. We had the campground to ourselves with hookups to water and electricity. After driving up from southern California, we were fortunate to find a campsite at the Rainbow Village RV Park right behind the coffee shop where our daughter was working every summer. We stayed half the summer, biking the canyon and hiking the ridges and peaks surrounding the village. A highlight was backcountry hiking with two of my daughters inside Denali National Park. The RV was nestled snugly behind the row of log cabin tourist shops, a great base of operations. Wendi could write her own story about “wild” places she has stayed the night. She spent 12 summers in a row in this dry cabin near Denali. One winter we set out to camp only on islands where we could walk the beaches all winter long. Dauphin Island was our choice for the month of January and we were camped in the woods a short walk from the gulf beach and historic Fort Gaines. The beaches along the Gulf are white sand. Dolphins cavort just offshore. Fort Gaines surrendered to the Union Navy during the Civil War. This is one of my favorite backpacking spots that’s not far from my home in Michigan. The island is part of the Sleeping Bear Dunes National Lakeshore and is run by the NPS. It is entirely covered with hardwood forests or perched sand dunes. The extensive network of hiking trails can thoroughly exhaust even the most hearty of souls. As a lifelong adventure sport director, I have been there several times with groups of kids. Hobo dinners are wrapped in foil and cooked directly on the campfire. No pans, no grill, no problem. What I liked about our winter vacation rental on the beach was not the infinity pool or the air-conditioned condo, but the close interaction with the natives. Many resorts are isolated and walled away from the locals meaning you miss a lot of the indigenous flavor. Our beach was shared with the fishermen and their kids. We were able to walk to the local tienda for a cold Coke and provisions for cooking our own meals. Local shuttles would take us to the nearest village for a few cents. The lighthouse is staffed by teams of volunteers who spend two weeks living in the original light keepers’ quarters and running the gift shop, museum and tower which is open for a fews hours every day. The rest of the time we are free to hike the dunes or splash in the refreshing waters of Lake Michigan. Volunteers take turns preparing meals for each other in the old kitchen. Also the best place to get wifi. We used to live about an hour’s drive from this park so we got to know it pretty well. One of our favorite things was when we were lucky enough to get one of the campsites that are right on the shore with our rear bumper almost hanging over the beach. The water is shallow and stays warm in the fall so we would often wait till after Labor Day when the kids were back in school and there was plenty of elbow room in the park. I usually avoid the resorts when I want an authentic experience and hiking in the mountains of Mexico is one I have been able to do several times. Usually I have been directing a group of youths on a cross-cultural experience. The organic nature of this kind of adventure means that we eat the local foods and use the local outhouses. – if there are outhouses. Fun! Okay, I have spent the night in at least 15 of the most amazing national parks. That could be a list all of its own. But the Redwoods were so remarkable I had to mention them. We pulled into a deserted county park in the redwood forest late at night and weaved our way between the giant trees that showed in the headlights. We found a spot to set up the tents and went to sleep. Climbing out of the tents in the morning, we were rendered speechless at the fantasy land that surrounded us. Nothing tops this. Huge! Well, this listing is just a sampling of the wild places where I have stayed. It makes me sad to leave out a whole bunch of wonderful places. Maybe I should write a Part Two including Glacier National Park, Pictured Rocks National Lakeshore, the over-water bungalow in the Maldive Islands… and so on. I would be interested in hearing about a wild place you have stayed in the comments below. Do tell! Note: Header photo at the top is Butler Wash, Bluff, Utah, banked by cliffs on both sides and sheltering many ancient cliff dwellings nestled on the ledges and alcoves. I can’t count the numbers of times others, upon learning that I am travelling alone or camping alone or going to the movies alone, incredulously say “I would love to do that, but I just can’t!” And “just can’t” has a different meaning for everyone but usually it is some variation of being scared or anxious or overwhelmed or intimidated or….you get the picture. Here’s the thing: if you have actually said some variation of wanting to do that someday but being too scared to do it then you are actually worlds ahead of those who have never even considered doing anything as “crazy as this.” If you are one of those who has never ever in your life considered challenging yourself in this way and are totally happy the way your current level of adventure is in your life, then so be it and awesome for you (and why are you reading this blog?) BUT if you are so blessed/cursed with this desire to go out and explore the world, then you are already at the “but HOW do I actually do it” phase. This phase is where I am a Viking. So I got your back. Here’s the dealio. Ya gotta DREAM BIG! But start small. First, spend some time daydreaming about those huge things you wanna do and where you wanna do them. This is not the time to be practical or reasonable, this is the let your inner child run wild. For instance, I want to sip wine (and eat pasta) in a café in Italy after a day of gazing at art and architecture. I wanna gulp beer in a Bavarian tavern after touring the Neuschwanstein Castle. I want to blissfully wander around Quebec City some long winter weekend. I want to sweat in a bazaar in Istanbul. I wanna savor Scotch after a day of angling in Scotland. I want to sip pina coladas on tropical beaches (at least once a year). And, above all, Iceland. All of it. Etc. And so on, and more. These are my dreams. (And someday, many of them will be my stories). Take some time to dream big. Write those big dreams down. Tell them to someone. Speak your fantasy into a wish. Turning those wishes into goals comes later. So, now you are dreaming big….. but, did you get overwhelmed at all by thinking about actually doing those? Did you catch yourself saying “aw, but I can’t actually DO these things.” This is where the starting small comes in. When it comes to action, small steps are the key to later taking big leaps. The truth is I already have a lot of my big dreams done, many of them were easier to do with other people….I’ve wandered art museums and sipped wine in Paris in the shadow of the Eiffel Tower, I’ve toured London several times, I spent a month in Hong Kong, a summer in Morocco, and sipped many a pina colada on many a tropical beach. But I can’t do all of those remaining wishes of mine right now…not only do I not have the time and money yet, but I also don’t have the research done yet. And some of those are really intimidating if I don’t know what I’m doing yet. It doesn’t matter how much I travel, I am still very intimidated about travelling to unknown places (especially where I don’t know the language) alone. I’ve done it and I will continue to do, but it is still scary. And the longer times in between trips, the more anxious I get before the next big one. So I often have to start small again. Starting small means starting where YOU are NOW. And it’s different for everyone so it isn’t gonna be starting at the same place someone else starts (so stop comparing). What are you currently comfortable with and is there a way you can push just a teeny tiny bit past that? Are you okay with flying somewhere alone for business, but get overwhelmed with going on a vacation by yourself? Are you ok with driving a few hours away but not quite ready for a big road trip by yourself? Are you okay with running into Starbucks and waiting in line for your Pumpkin Spice Latte alone but not ready to go to a nice dinner by your lonesome? Figure out small step things you can do. For instance, on your next business trip, maybe stay 2 days longer and do some sightseeing alone. Or perhaps choose a place you are okay driving, but book a night in a hotel and go out for dinner while there to make it more of a roadtrip. Next time you are in the Starbucks line, get your coffee “for here” and get used to sitting alone quietly reading a book while caffeinating. This is your chance to push yourself just a little more and have some fun with it. Once you start small where you are NOW, you will have found yourself just a little further along. And then, you start small from where you are then. Before you know it, small steps turn into quite the epic journey. 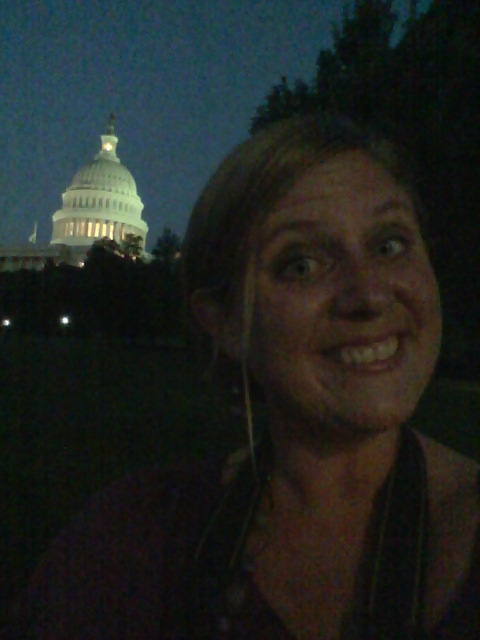 This is me exploring our nation’s capitol by night when my work sent me there for a conference by day. Starting small. But I’d been dreaming big about visiting DC for decades.